I'm so excited! I got news today that I've won a book award. I won a Silver in the Health/Medicine/Nutrition Category of the 2012 Independent Publishers Book Awards for my book, The Non-Toxic Avenger, What You Don't Know Can Hurt You, by New Society Publisher! 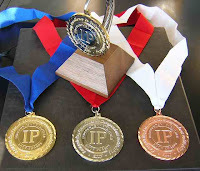 Not only do I get a medal and certificate and medal stickers for putting on my book, but there's also an awards ceremony on June 4th, during BookExpo America, in New York City. Congratulations. That is so cool! Congrats! You deserve it after all the hard work you've done! Nice! Lovely to be acknowledged for your fine work. Gonna pull out the tie dress for the awards ceremony? Congrats! Woo hoo! That's fantastic. Congratulations! Well done. Congrats. All that stuff!